Registration fees are $45 through January 31, 2019. They increase to $55 on February 1. You must register by February 18—no walk-in registration will be accepted. Your fee includes the keynote session and lunch, four additional classes, handouts, access to the Nursery School vendor area, morning coffee and tea, and a tote bag you can fill with catalogs, brochures and money-saving coupons from local businesses. You can register online at University of Illinois Extension’s website serving Henry, Mercer, Rock Island and Stark Counties which is http://web.extension.illinois.edu/hmrs or call Rock Island County Extension at (309) 756-9978 for more information. A free shuttle will run from the parking lot to the Gerber Center starting at 7:30 am, note the first session begins at 8:15 am. Here's the speakers and topics from which you can choose one from each session. Note: class sizes are limited and offered on a first-come, first-served basis. Want to know the food you eat is as healthy as possible? Want to taste the garden-fresh vegetables bursting with sweet, juicy flavors and vibrant colors? Want your family to appreciate the ways things grow and understand the value of food? Come learn how fun and rewarding growing your own vegetable garden can be while learning what it takes to keep your plants healthy and vigorous. Do your part to save the pollinators - the bees, butterflies, moths, and other insects critical to our food supply and human survival. You may not realize that manicured lawns, exotic plantings, and enticing hybrids and cultivars often provide no value to pollinators. Plant a "pocket" of flowers that attract and nurture pollinators in your own yard. Garden designs discussed are for small spaces and are easy to plant and maintain. By placing pollinator pockets into your landscape, you provide an oasis for pollinators. As a greenhouse owner, Maria has first-hand knowledge of what’s new for this year’s gardening season. She will be sharing some of the latest materials available for 2019 and ways to use them in your own space. Catch Deborah’s passion as she takes you on a journey to explore wild-edible plants in your yard, or nearby. Through slides and samples, you will learn to appreciate a few nutritious ‘wonder-weeds’, plus how to collect and use them. You’ll also learn patterns in nature that help you know what and when to harvest. Take home a list of 100 edible plants and helpful tips. Sociologists have shown through research that people want to have wildlife in their lives. However, what can we do when rabbits, squirrels and even deer wear out their welcome? Dave we will discuss management techniques to help you reduce conflicts with wildlife in your backyard and garden. What makes a great hosta? With over 6000 registered cultivars the choices are overwhelming. Learn the characteristics that the breeders use to evaluate the diversity. Each of us buy and grow hosta for different reasons. Expand your hosta palate with this informative talk. Repeat from session 1. Extra DIY fee of $30 for this make and take. highlight his personal picks of choice plants and other garden elements, that will be sure to add eye-candy to the garden throughout the year. Born to shop? You’ll love our vendor area packed with items of interest to the gardener. You’ll have time during breaks and lunch to look through a wonderful selection of yard art, tools, books, plants and more. PLUS, your paid registration automatically puts you in the drawing for an array of wonderful raffle prizes donated by area businesses! Growing your own fruit is rewarding and challenging. In this session, Bruce will discuss how to start apples in your backyard and their successful maintenance focusing on weed management, pruning, irrigation, harvesting and post-harvest handling tips. One of the most overlooked delights of the garden are small creatures that spend most of their lives right under our noses. Moths tend to go unseen, in spite of the fact they outnumber butterflies 10 to 1, and many moths will easily win a beauty contest against their butterfly cousin. Learn how-to, where-to, and when-to recognize both the beauty and wonder that these winged garden guests impart to your garden. You may remember Chris from the 70’s band Natty Scratch or have taken a guitar lesson from him at Davenport’s River Music Experience. These days, from the simple gift of a packet of giant zinnia seeds, Noth has become somewhat of an expert dahlia and zinnia grower. He’ll share his resources for learning the basics as well as tips and tricks he’s developed over the years including seed starting in his basement, overwintering the tubers and making spectacular bouquets of total color. Learn how to get blooms as early as possible and sustain the parade of color throughout the entire gardening season. Join Kristin for a TEA-rific make-n-take. This session will engage you with a brief history of tea and tea gardens, types of tea, growing herbal teas and brewing recommendations, health benefits and tea samples. Everyone will get to be creative and make-n-take a few sachets from an assortment of herbs and tea ingredients. NOTE: This session is an additional $15. The best ways to entice new gardeners is growing unique and colorful vegetables. In this session, Bruce will discuss plant characteristics that cause these changes, and popular & new cultivars of unique vegetables. Many of us enjoy feeding birds by adding a bird feeding station to our backyard. As gardeners we can do much more to enhance the backyard habitat beyond the bird feeder. Learn how trees and shrubs, flowering plants, nest boxes and water can round out your backyard habitat for birds. There has been an explosion of cultivated varieties in the hydrangea family. 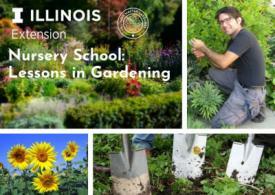 This talk will help to explain the different species, cultivation, flowering shapes and times, and how to prune. There is a hydrangea for every landscape situation. Learn about some of the newest introductions that you can look to add to your garden landscape. This hands-on class will show you how easy it is to safely make herbal vinegar for use in: cooking, salad dressing, gifting and more. Together, we will make an herbal vinegar for you to take home. Participants will receive a decorative serving container. In addition, a helpful study guide will be useful for years to come. NOTE: This session is an additional $15. University of Illinois Extension provides equal opportunities in programs and employment. If you need a reasonable accommodation to participate in this program, please contact our office at (309) 756-9978. Early requests are strongly encouraged to allow sufficient time to meet your access needs.